.... for those that enjoy 'tracking' their car. TrackScotland are running a track evening on Thursday 15th September 2011. For this trackday, and the rest of our trackdays this year, we will be asking for donations from additional drivers and passengers to go towards our fundraising efforts for TrekScotland. We would suggest a £10 donation for additional drivers and an open donation for passengers, to be given at sign on. I will be there to badger you! Please remember we need you to book in advance to make these days happen! yep, count me in ! Is there likely to be a horde of track-day Novas panel beating there way around the hairpin? Any info form previous attendees that might help me commit would be appreciated. My first time taking my own car onto the circuit in anger btw. 1993 Brilliant Black V-special Roadster R.I.P. HSD Monopro, XRR 522s, twin exit. Work in progress. last time, there were two mx5s in attendance, myself and a chap called Chris in a white mk1, other cars i can recall were : 2 x mr2, a bmw m3, a vx220, several civics, integras and a prelude, a couple of big evos and subarus, a couple of elise / exiges, a few caterham / westfield / super7s but the track never felt crowded. open pit means you can go out and come in as often as you are comfortable with. 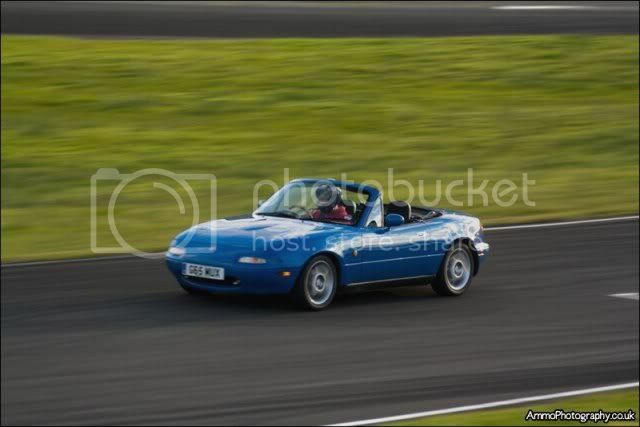 there are likely to be 3 or 4 mx5s on the next event, i would encourage anyone to come along, even just to spectate or jump in for a few passenger laps. i'm by no means an expert but would be happy to sit with a newbie for their first session to give guidance if needed. go on, you know you want to ! "go on, you know you want to !" Great sales pitch there sir. You on commission? I know what you mean about the Hot Hatch days though, that was my biggest fear. They were always a great spectacle but I'd be gutted to be twatted by someone driving a shed with nothing to lose. I'm off to get signed up. Look out for a black MK1 and a driver with the 1000 yard stare!!! .....and done. See you there. i might have to bring the porker instead just to keep up ! Trackday noob here. Its going to be a bloody steep learning curve but I've been wanting to do this since I bought the car two years ago. ps....ANY advice gratefully received...before, during and after. Went along to Ingliston yesterday for the Trackscotland sprint event. Wish I'd paid my money...looked great fun. Saw a few of the cars that will be on track next week for the track evening as well. oooft! Quick. i only managed to nip along to Ingliston for 5 mins, as soon as i got there, work was on the phone dragging me away ! looked like great fun though. looking forward to next week already, hope the weather is kind. i'm debating whether or not to sign up for the dreadnought this week - if it's sunny and i've got my brakes fixed by then, i reckon i might be tempted. see you there ? i see there's one mx5 booked, not familiar with the name, anyone know Ross Taylor ? If you want to get on track please book now.... not in 1 week when it may be full! Glad I found at least two other like minded mx5 owners in this part of the country. Been getting frustrated recently at the lack of owners getting on track up here be good to see a few out there. Really looking forward to the 15th, I'm also booked up. I'm Chris by the way with the white mk1 1.8 as mentioned above. Saw you pull up on Sunday Mark, shame you couldn't hang around. Was an awesome day, I managed 6 runs altogether I think. Kev, no worries at all with track etiquette at trackscotland events and if you're unsure of the layout or setup you're more than welcome to come round with me for a few. glad you found us here ! i'd better get cracking with my brakes - new pads and discs to go on plus an oil change and front lip to fit tomorrow. I saw your 1.8 on Sunday. That was a rough old track btw. Nice to see you edging the MR2 on the day though. That narked my mate no end being a rev2 owner. ! I might take you guys up on your offers of a couple passenger laps. Every little helps as they say. I'm hoping to nip along to the Dreadnought night tomorrow. Maybe see you there Mark. Track wasn't actually as bad as it looked, for the most part it was really good. Good mix of corners and grip levels. I was actually a full second and a half ahead of the mr2 which doesn't sound much until you consider the Ariel Atom was only five seconds ahead of me. Just showing off now! Gaps get a lot bigger round knockhill mind. 4 spaces still available if anyone fancies joining the FIVE MX5s that will be there ! I'm planning to be there for 4ish, plenty of time to check fluids, tyre pressures etc before the briefing. The forecast looks promising, dry would be nice, a little bit of sun would be lovely. Might not be completely dry.